I’m trying to be objective about this hat, maybe if it weren’t checkered? Well, in that vein I have to say Gene Tierney looks good in anything. Here she’s dining with the fab Vincent Price, playing her gold digging fiancé (Shelby Carpenter), in “Laura”. Directed by Otto Preminger. Based on a novel by Vera Caspary. Costume design by Bonnie Cashin – who went from film to designing her own line. I think I agree. If it were a solid color I’d like it more. 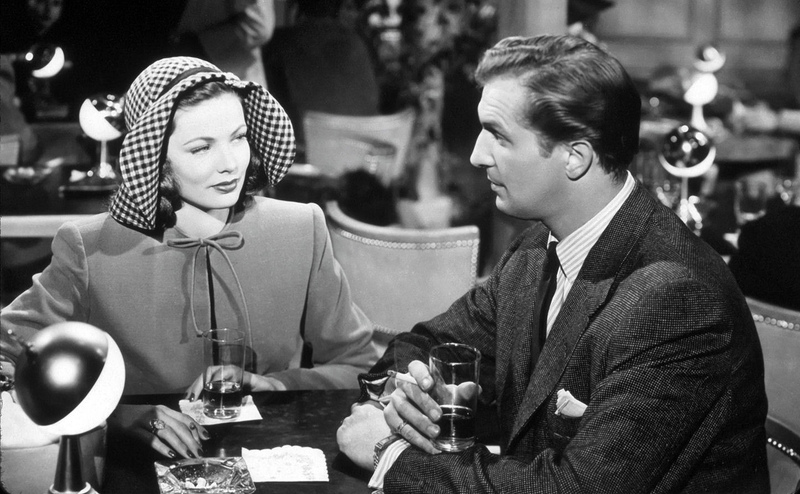 But even with a less-than-fabulous hat, Gene Tierney was still gorgeous, wasn’t she? It’s kind of extraordinary how beautiful, and uniquely beautiful these actresses were. I could tell you all about conformity and Botox and bridges of noses with very subtle work theses days, but I honestly don’t think it compares with what these gals had going on well over half a century ago. You are so right. I was watching something with Rosalind Russell the other day (I can’t remember which movie), and even though she wasn’t considered one of the raving beauties of the day, she was still so much more attractive and compelling than any of the twinkies in Hollywood today. There is only one thing to say Vickie and Madame W……they had faces then! ……..Max ..is that Paramount on the phone? I know! ….. and Madame must never know. It looks a little to much like a bonnet. It really wouldn’t matter what she wore,this hat included—she is truly exquisite! I think her style and grace in this movie is something all women can emulate for all time. I especially love the scene, a flashback, where she and Waldo are listening to records, while she smokes in her cardigan. I read somewhere that she started smoking to lower her voice in 1940 after being compared to Minnie Mouse – I can’t even imagine what that reviewer of long ago was talking about. Oh, Laura and Gene Tierney… Lovely. She pulls off that hat supremely well – and the outfit too. She had such a smooth, glowing face, ah the curves of her cheekbones. She is kind of otherworldly, which suits the character: the dead woman who isn’t. I liked her in The Ghost and Mrs Muir, too. I seem to be the contrarian, here, but I like this hat. Oh, course, it could be because Gene Tierney is wearing it ;-). Contrary is good, especially when it comes to hats 😉 . What proves the point is that I didn’t notice the hat until I read your text and realized that yeah, the headgear is a bit questionable to modern tastes. I don’t think it’s her features alone, but that sense of confidence and comfort in her own skin that animates them. The Dandy is digging the ‘why this it’s just something I borrowed from Yasser Arafat’ look. Gentlemen! I stand corrected – and Dandy, that is too funny for before breakfast 🙂 .